There’s something about water-jet propulsion that seems to fuel innovation. 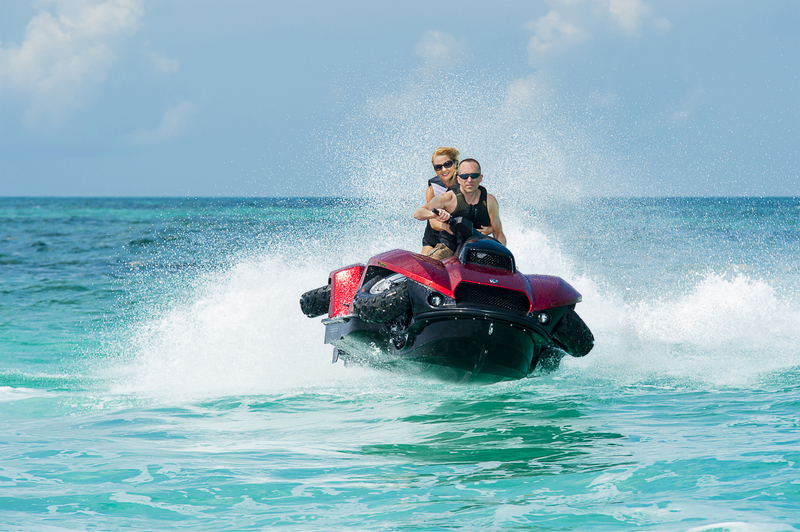 The development of personal watercraft, for example, has spawned significant innovations in boating during the past 25 years. I don’t have enough space here to describe the number of unusual and innovative personal watercraft upon which I have sat, stood or balanced precariously. But these days most PWCs, inheritors of innovative water-jet technologies, are built and sold by mainstream publicly traded corporations. Innovation continues, but within corporate constraints that call for profit without unnecessary legal liability. Outside the major corporations, though, there are a couple of water-jet-powered products that push the envelope for PWC thrill-seekers. Both the Flyboard and Quadski have been around for a couple of years, but now seem headed for mainstream acceptance. The Flyboard, developed by French racing PWC builder Franky Zapata of Zapata Racing, is certainly the most photogenic development. It’s likely the most thrilling too. I have not tried it personally, but if the CBC’s Rick Mercer can do it, it can’t be that difficult. 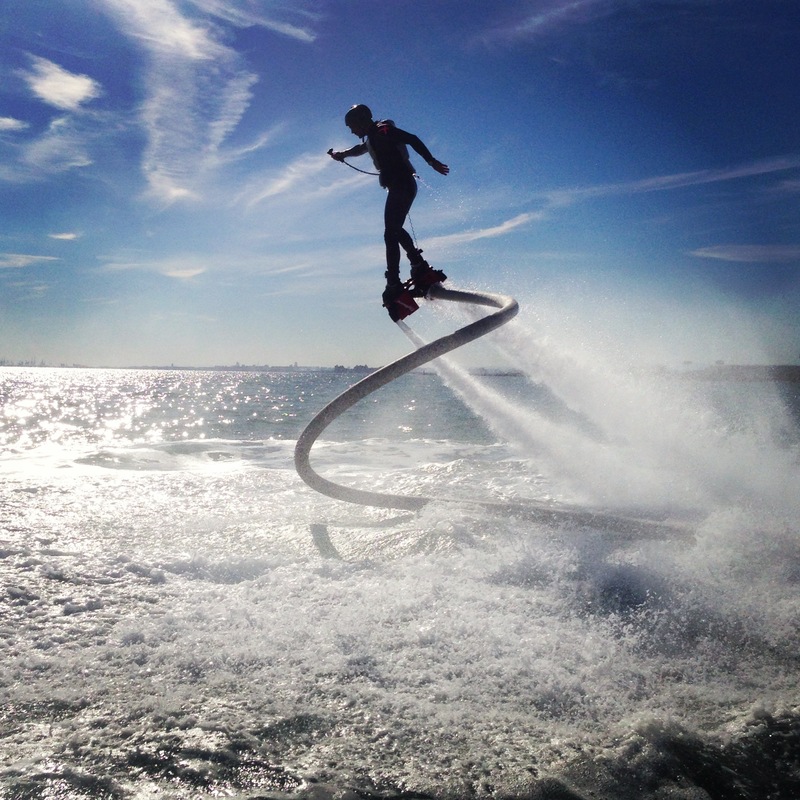 The Flyboard’s main appeal is that it channels the concept of flight first seen in the high-flying personal jet-pack in the 1965 James Bond movie, Thunderball. The Flyboard is probably the closest any ordinary civilian will get to experiencing the sensation of jet-powered personal “flight”. In the case of the Flyboard, though, propulsion and hand-held stabilizing jets are fuelled by a hose attached to the nozzle of a stock PWC. OK, you can’t reach the stratosphere because you remain connected to a PWC by a 30-foot (9 m) hose. But skilled aficionados of the new sport (can we call it that?) do high-flying and dolphin-like diving manoeuvres that are athletic and probably pretty thrilling. Prices start at $6,800 plus the cost of a PWC, so Flyboarding is relatively affordable (try buying a jet-pack). The newest Zapata toy is a Hoverboard, a kind of PWC-powered jet wakeboard right out of a super-hero comic book. 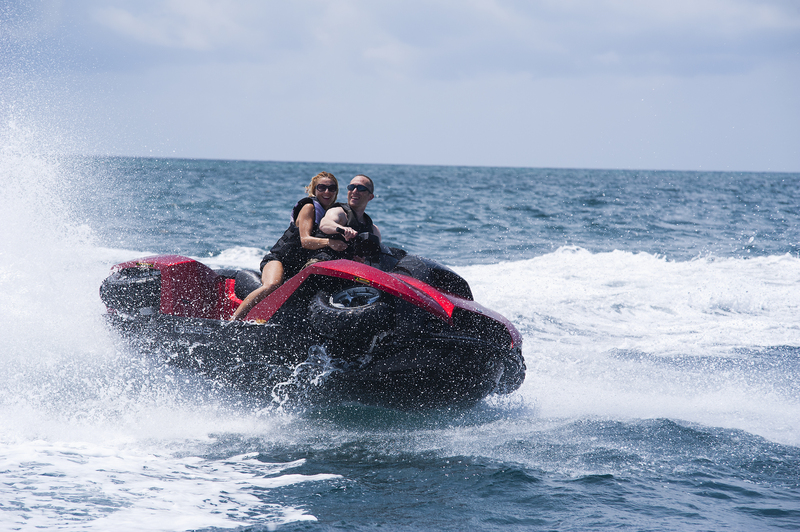 It gives thrill-seekers an opportunity for another form of fun. There are busy Flyboard distributors and operators in Quebec and B.C., both offering lessons and group experiences along with the gear. My prediction is that both the Flyboard and Hoverboard will spawn plenty of rental and lesson operations, but fewer widespread sales. But maybe I’m just getting too old. By comparison, the Gibbs Sports Quadski seems tame. It’s basically an amphibious PWC that pushes the boundaries of travel on land and water. It was developed by New Zealander Alan Gibbs and is now being sold across North America. On land, it’s a capable ATV. On the water, it’s a wide-beam PWC. Amphibious vehicles (think Amphicar) are always cool. At 10 feet 6 inches (3.2 m) the Quadski is a manageable length. Reported top speeds are 45 mph in land and water. I can’t wait to try one out and hope to schedule a test ride with local distributors this spring. But with a price in the $40,000 range, it may find a limited market. That said, there are gadget-loving boaters who always need to have the latest and greatest inventions. Innovators like Franky Zapata and Alan Gibbs are counting on that. This article is featured in the Winter 2015 issue of Boats&Places.